Orcas, or killer whales, are the largest of the dolphins and one of the most powerful predators of the cold sea. They are immediately recognizable by their distinctive black-and-white coloring, large size and a huge mouth filled with sharped teeth, creating a sadistic smile when opened. Orcas have never been extensively hunted by humans, and they feast on marine mammals such as seals, sea lions, horkers, and even whales, employing teeth that can be four inches long. They are known to grab horkers right off the ice. They also eat fish, squid, mermaids and seabirds. 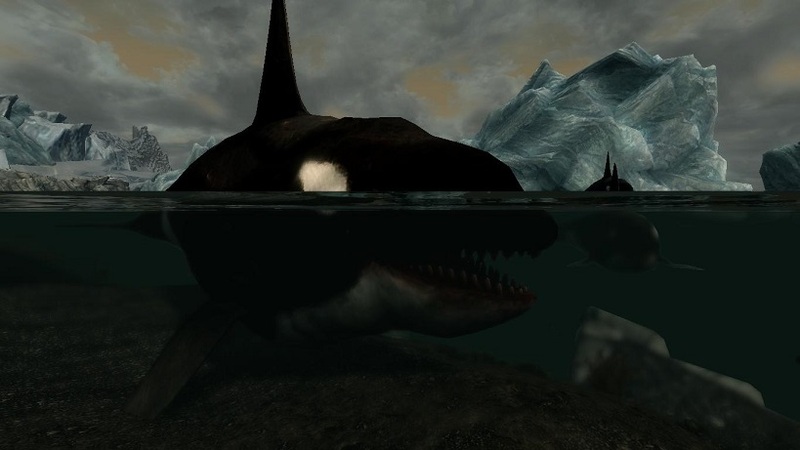 Though they often frequent cold, coastal waters, orcas can be found from the ice coasts of skyrim to the waters around the deserts of hammerfell, despite that, they seems to not occur on the seas of solstheim. Orcas hunt in deadly pods, family groups of up to 10 individuals. The pod use effective, cooperative hunting techniques that some liken to the behavior of wolf packs. Whales make a wide variety of communicative sounds, and each pod has distinctive noises that its members will recognize even at a distance. They use echolocation to communicate and hunt, making sounds that travel underwater until they encounter objects, then bounce back, revealing their location, size, and shape. This mod in particularly adds only a pod of something around 10 individuals that roams across all the sea of ghosts on the north coast of skyrim, hunting for prey.